In the fall, Colorado is transformed into a natural arena of shimmering colors, with the state’s signature gold Aspen trees. These 10 trip ideas will point you in the direction of shimmering yellows, oranges and reds. Maroon Bells The iconic Maroon Bells, two towering 14,000-foot mountains nestled in the Maroon Bells-Snowmass Wilderness, are the most photographed peaks in North America. Located in the 2.3 million acre White River National Forest, the Maroon Bells tower over numerous hiking trails that offer unbeatable views of golden aspen trees. The area is accessible by car, however buses run daily through Labor Day and on weekends through October 6 from Aspen Highlands. Gunnison is home to Kebler Pass, which boasts the largest aspen grove in North America and is one of renowned photographer John Fielder’s favorite places. Ohio Creek Road is a great starting point, as it passes some unique natural landscapes, including a series of ranch buildings marking the abandoned site of Castleton and the spires of “The Castles” — remnants of volcanic ash and mud that erupted from the West Elk Volcano some 30 million years ago. Note: The pass is unpaved. 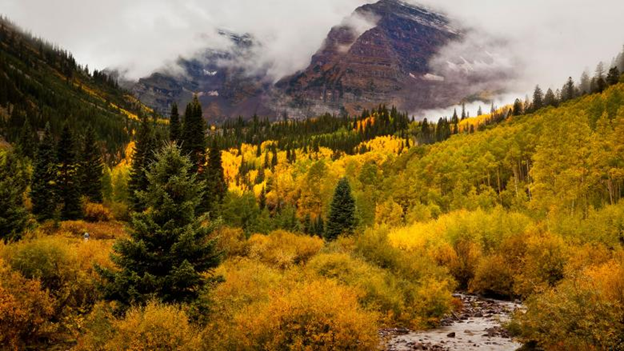 San Juan Skyway, a breathtaking 236-mile loop through the San Juan Mountains of southwest Colorado, offers visitors an amazing array of fall colors and includes a 70-mile stretch known simply as the Million Dollar Highway. The Durango & Silverton Narrow Gauge Railroad offers a special Fall Photo Train that coincides with optimal fall foliage. Another unique way to experience Colorado’s fall colors is with Soaring® Tree Top Adventures, home to 27 zip lines that pass by brilliant aspens. The highest continuous paved road in North America winds through Rocky Mountain National Park from Estes Park in the east to Grand Lake in the west. With more than eight miles above 11,000 feet and a maximum elevation of 12,183 feet, Trail Ridge Road is an amazing vantage point for leaf peepers and is a favored spot for photographers. The Rocky Mountain Nature Conservancy offers hands on wildlife and nature ecducation. Colorado’s Western Slope is home to the Grand Mesa, the world’s largest flat top mountain, and Colorado wine country. In addition to the reds, whites and rosés made in Grand Junction and Palisade, fall brings with it glorious colors. Powderhorn Mountain Resort‘s vibrant scrub oaks contrast with golden shimmering aspens along the Grand Mesa Scenic and Historic Byway. This dirt road just west of Steamboat Springs, is lined with rows of glowing aspen groves. The pass winds eight miles up toward the Continental Divide and Summit Lake, offering stunning views of the surrounding foliage. As the fall colors become more robust, locals recommend a hike to the pristine Zirkel Wilderness Area’s Three Island Lake Trail, which takes hikers through coniferous forests and high meadows, past glacial lakes and vistas. The 6.1-mile (round trip) trail is moderate in difficulty. Peaking at an altitude of more than 9,400 feet, the La Veta Pass on U.S. Route 160 in southern Colorado (west of the town of La Veta) is one of the most scenic drives in the state during the fall season. Gold aspen trees mixed with dark green pines line the pass, while the magnificent Spanish Peaks and Sangre de Cristo Mountains tower over the foliage of the San Luis Valley. The Rio Grande Scenic Railroad (May through October) passes through mountain meadows, canyons and colorful foothills otherwise inaccessible by cars. The Telluride Free Gondola is one of the most popular ways to view Telluride’s amazing fall colors. The aerial views include the town of Telluride, its box canyon and colorful valleys lined with aspens and evergreens. For yet another way to see Telluride’s foliage, several trailheads are located right in town. Locals suggest the Jud Wiebe Trail, a three-mile loop that winds through large aspen groves and passes by Comet Falls. Colorado Hwy. 62 over the Dallas Divide represents an epic fall Colorado drive. Starting near Ridgway, visitors can get an amazing view of Mount Sneffels, one of Colorado’s 58 14ers, and the expansive Sneffels Wilderness Area, which offers several hiking trails for those wishing to venture out further. The route eventually connects with Hwy. 45 and Lizard Head Pass, which offers views of Wilson Peak, the very mountain that inspired the iconic Coors logo. Peak to Peak Scenic and Historic Byway is Colorado’s oldest, having been established in 1918. The byway starts in Boulder and offers unmatched views of the Continental Divide and its dramatic fall colors. Though the byway is less than 60 miles in length, there are numerous stop off points along the route, including Rocky Mountain National Park, Golden Gate Canyon State Park, the Arapaho and Roosevelt National Forests, and the Indian Peaks Wilderness Area, all of which offer their own unique vantage points for leaf peepers.